I’ve never climbed before. Do climbers look forward to new bouldering routes at their local climbing facility the way I look forward to new Weezer albums? Yep! New bouldering routes are appreciated. 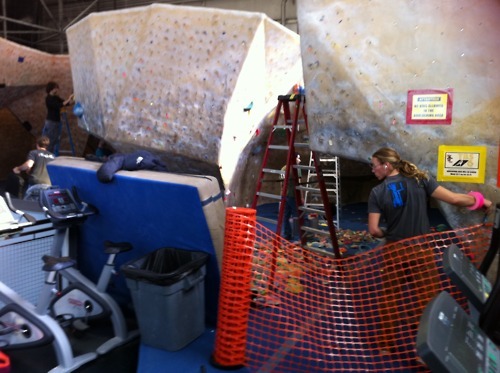 When I am short on time to climb a taller wall with a belay or not a willing partner bouldering is my back up. And fun for those afraid of heights. weezer? seriously? i think they would even admit that every album since pinkerton was a turd. OMG go jump in a lake. I had no idea they use ladders to set routes. I thought you actually had to be a good climber. Heck yeah….are you kidding?? Those old problems were getting hecka tired. There’s going to be so much to work on now! I climbed for my first time a couple weeks ago! And yes, the upgrade was sorely needed. Do you mean to ask “do climbers look forward to new bouldering routes with a mixture of fear and excitement?” I personally really look forward to new climbing routes, but also worry that I will loose a chance to finally send a problem I have been working on for a while. Just razzing you about the Weezer thing.